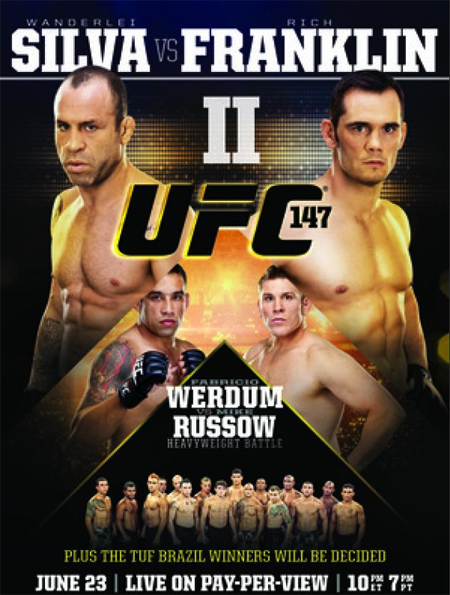 “UFC 147: Silva vs. Franklin II” took place Saturday inside Mineirinho Arena in Belo Horizonte, Minas Gerais, Brazil. A 190-pound catchweight contest between Wanderlei Silva and Rich Franklin headlined the fiesta. In addition, two “The Ultimate Fighter: Brazil” contestants secured their futures inside the Octagon by winning six-figure UFC contracts. 1stRound: Arantes a tad careless with his punches and Vieira capitalizes with a takedown with three minutes to work. Vieira advances to side control. He’s active with his ground-and-pound, but Arantes is doing a solid job of avoiding damage. Vieira, 10-9. 2ndRound: This is going to be a rowdy night. It’s only the first fight and the crowd is already quite boisterous. Arantes connects with a flying knee to the face. Vieira pushes forward, but misses with a wild flurry. Arantes scores on a couple of leg kicks. Vieira clobbers him in the grill with a spectacular spinning wheel kick. Arantes recovers and gets a takedown just as the horn blares. Vieira, 10-9. 3rdRound: Arantes thwarts a takedown attempt and takes top position. Vieira is paying the price for not planting his opponent on his back. They get stood up for inactivity. Close frame to score. Arantes, 10-9, but likely lost the contest, 29-28. 1stRound: Vinicius tags him with an inside leg kick, but Campos counters with a straight left. After much jousting, Campos trips him tot he canvas. He immediately advances to full mount, now takes his back. Vinicius scrambles free. Campos drags him back to the mat. Decent GnP, though Vinicius connects with some up-kicks and strikes off his back. Campos, 10-9. 2ndRound: Campos floors him with a left hook and pounces. Vinicius appears to have recovered, but is on his back fending off a kimura attempt. Campos is simply smothering him on the ground. Campos, 10-9. 3rdRound: Vinicius wobbles him with a flying knee to the midsection. He follows up with another knee to the stomach. Vinicius is giving Campos the business with a barrage of punches. It’s a wrap. Great rally by Vinicius. 1stRound: Mafra is very aggressive and dynamic with his attack. Perpetuo tags him with a counter left hand. They are flinging leather. Mafra eats a one-two combination. Perpetuo clocks him with an elbow just as the horn sounds. Mafra, 10-9. 2ndRound: Perpetuo scores on a big body shot. After a scramble, Perpetuo escapes from an armbar attempt. He’s now in top position and dropping hammer fists. Perpetuo is relentless with his assault. Perpetuo, 10-9. 3rdRound: Perpetuo drops him with a vicious right hand and follows him to the canvas. He’s bringing the pain. Game. Set. Match, Perpetuo. 1stRound: Solids shots landed by both. Viana gets him with a solid leg kick. Teixeira scores with a violent knee to the stomach. Viana answers with a body shot. Teixeira arrant on an overhand right and Viana clocks him with some punches in the clinch. Close stanza to call. Viana, 10-9. 2ndRound: Teixeira has a body lock, but Viana does a solid job of preventing the takedown. Teixeira got him down for a brief moment. Viana appears a tad gassed. Teixeira, 10-9. 3rdRound: Teixeira knees and shots to the body seem to have slowed Viana. As I write that, he clocks Teixeira with an overhand right. Viana takes a knee to the groin and time is called. Game on. Teixeira eats a left hook. Teixeira can’t secure a single-leg takedown. Teixeira drags him to the ground for a split second. Teixeira, 10-9, and likely took a razor-thin decision, 29-28. 1stRound: Heleno shoots, but eats a big right for his efforts. Drinaldo doing a solid job of fending off the takedown attempt. Drinaldo clocks him with a right hand a follows up with a knee to the midsection. Heleno is adamant about getting this fight to the ground, but takes another big knee to the body. Drinaldo gets top position and is laying the lumber. That’s all she wrote. 1stRound: Damm unleashing heavy leg kicks early. Medeiros lands a kick to the cup and time is called. Game on. Damm nails him with a big left hand and swarms. He takes Medeiros’ back and gets both hooks in with three minutes remaining. Damm locks in a rear-naked choke and Medeiros is forced to cry uncle. 1stRound: Dias secures a takedown and is working for an arm-triangle choke. Alcantara does a good job of fighting it off, but is eating some vicious punches. Dias picks him up and slams him to the canvas. Dias, 10-9. 2ndRound: Alcantara had a body lock, but Dias tipped him to the ground and ends up in top again. Alcantara attempts an armbar from off his back, though Dias manages to escape. Dias is draped all over him. Dias, 10-9. 3rdRound: Not much action in final frame. However, much like the previous two rounds, Dias gets a takedown. The crowd is getting restless because he’s not unloading anything too devastating. Dias, 10-9, and runs the table, 30-27. 1stRound: Fast and furious pace early. Werdum is straight headhunting. The Brazilian drops Russow with a right uppercut and follows him to the canvas. Werdum is unloading countless punches to the dome. Game over. 1stRound: Pepey unleashes a flying knee to set up a takedown attempt. Jason fight him off. Pepey is swinging for the fences, but comes up empty. He gets a body lock and pulls guard. Pepey is looking for a kimura from off his back. They get stood up due to inactivity. Jason connects with a flying knee, but Pepey pulls guard again. Interesting round to try and score. Pepey was on his back for most of the stanza, but that’s because he wanted it that way. Pepey, 10-9. 2ndRound: Pepey comes flying in with a flurry, landing a couple of wild punches. He pulls guard for a third time and the crowd boos. Jason tags him with an elbow. Jason gets to his feet and scores with a right. And another right. Jason clocks him with a left hook just before the end of the round. Jason, 10-9. 3rdRound: The six-figure contract is still up for grabs entering the final stanza. Jason tags him with a left. He follows up with a big left hook that dazes Pepey. Jason takes a kick to the groin and time is called. Game on. Pepey tries to pull guard again. Jason scores with a right hook. He takes another kick to the cup and time is called. Game on. Jason, 10-9, and probably won the TUF Featherweight tourney, 29-28. 1stRound: Ferreira lands a capoeira kick to start things off. Decent action, but nothing significant landing for either fighter. Moraes takes a kick to the groin and time is called. Game on. Moraes scores with a barrage while in the clinch. Close round to score. Ferreira, 10-9. 2ndRound: Ferreira comes out aggressively. He dropped Moraes with another capoeira kick and goes in for the kill. He’s unloading some shots on the ground, but it appears Moraes has recovered. He’s bloodied, though. They are back to their feet. Moraes catches him with a short elbow and pounces. He unleashes a barrage, but couldn’t finish him. Great rally. Ferreira, 10-9. 3rdRound: Ferreira floors him with several punches and allows Moraes to get back up. Moraes tags him with a front kick to the face. Ferreira remains the aggressor, but is much more careful. Moraes wobbles him with another short elbow. Ferreira drops him with a straight left. Ferreira, 10-9, and likely won the scrap, 30-27. This could be controversial. 1stRound: Silva clobbers him with a straight right. Franklin answers with a straight left of his own. He follows up with a left jab. Franklin’s hands look sharp. Silva scores with a big head kick. Franklin, 10-9. 2ndRound: Franklin tags him with a solid right hand. Silva’s face is bloodied. Franklin is doing a good job of taking the center of the cage and forcing Silva’s back against the fence. Silva forges ahead with a one-two combo. Silva floors him with a big right hand and he pounces. Silva is giving him the business. Franklin manages to survive the round. It was close to getting stopped. Silva, 10-9. 3rdRound: Let’s see how well Franklin recovered and if Silva gassed himself out from the onslaught. Franklin appears fine, he’s damaging Silva’s body with kicks and punches. Silva hasn’t done much this round, so he may have tired himself out. Franklin gets a takedown and is bringing the pain on the mat. He ends with a flurry as the horn blares. Franklin, 10-9. 4thRound: Silva connects with a right hand. Franklin still looks fresh and Silva has clearly slowed. Franklin takes an accidental kick in the groin and time is called. Game on. Nothing too devastating in this frame from either fighter, but Franklin has been much more active. Franklin, 10-9. 5thRound: Silva’s going to need a finish. He looks more hungry to start the final stanza, but who knows how much he has left. Franklin’s hands still look sharp. Seems like Silva saved everything for the last minute, he’s going for the kill. He tagged him with a couple of punches, but too little too late. Franklin appeared to drop him for a split second. The scrap ends with a flurry by both fighters. Close round to score. Franklin, 10-9, and wins, 49-46.